Karen Babcock, Folkmoot’s executive director, remembers the group’s Friday-night cameo. “They were just like rock stars; we actually had to hold the crowd back,” she says. This year, expect a similar surprise appearance when one of Folkmoot’s performing groups brings an international flavor to the drum circle on the first night of Bele Chere. The 2012 Folkmoot festival spans July 18-29, with 24 performances in nine counties and 14 cities in the Southeast. Festivals past are rich with examples of amazement, Babcock says. “… One year — and this is before I got here so it’s just hearsay — they actually had Palestine and Israel here at the same time, and it was phenomenal. They tell me there was absolutely no stress, no tension. They were as warm and open to each other as any two groups could be.” Whether you’re looking at performers’ interactions with each other or the audience’s interaction with the performers, “We find out by the end of the festival that we’re really not all that different,” Babcock says. This year’s lineup pulls from all over the world map: Whitireia from New Zealand; Cosandama from Peru; Kandarpa Gunita from Indonesia; Talija from Serbia; Sining Kumintang ng Batangas from Philippines; Ballet Folklorico Brumas del Torito from Puerto Rico; Halau O Po’ohala from Hawaii; Die Rooselaer from Belgium; and La Poulido de Gemo from France. With many performances happening throughout the region, there are multiple opportunities to see the different groups. Eight events feature all of the performing groups in the same show. This will be the most “all-group” performances that Folkmoot has offered in many years. Depending on the size of the venue, the other performances in the region will have select combinations of performers. “The groups don’t just have one performance that they repeat,” Babcock explains. “They might have a repertoire of up to 12 or 13 dances that they’ll be rotating as they go through the different venues.” Additionally, they’ll even have different costumes for different performances. With performances throughout the region, chances are that there will be one that is convenient for you. 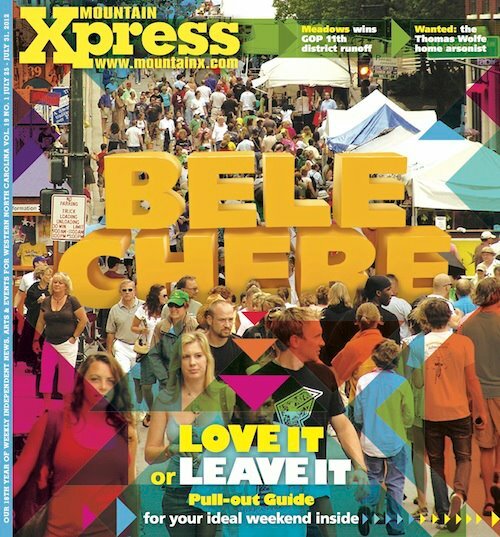 Or perhaps you’ll want to use this as an excuse to escape the crowds of downtown during Bele Chere. where: Performance locations include Asheville, Bryson City, Burnsville, Canton, Cherokee, Clyde, Cullowhee, Flat Rock, Franklin, Hickory, Jonesborough, TN, Lake Junaluska, Maggie Valley, and Waynesville. when: Twenty-four public events, through July 29. For more information, see the complete Folkmoot schedule at http://www.FolkmootUSA.org or call 877-365-8725.